2018-2019 Williamsburg Symphony Orchestra League Officers. From left to right: Marie Mamikonian, Corresponding Secretary; Ken Mitchell, President; Paul Try, Vice President; Celia Adolphi, Recording Secretary; Cathy Reed, Treasurer. The Williamsburg Symphony Orchestra League (League) is a group of dedicated music enthusiasts whose experience, interests and generous volunteer hours have been supporting the orchestra for many years. The Williamsburg Symphony Orchestra was founded in 1984 with the goal of bringing classical music to children. Today it is an internationally-recognized professional orchestra in the heart of historic Williamsburg. The League has supported this transformation through service, outreach, and innovative fundraising. 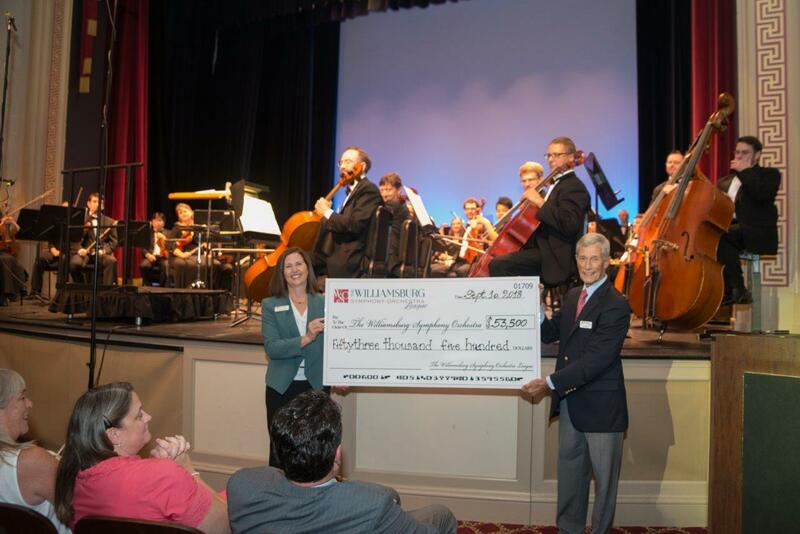 From funding the Symphony’s first annual pops concert in 1996 to contributing nearly 4,000 volunteer hours annually, the League has worked side-by-side with the orchestra to make it the outstanding ensemble it is today. Since 2000, the League has contributed over $640,000 to the WSO, a record amount for a support organization of its size. As a League volunteer you can provide needed assistance: working behind the scenes at rehearsals, transporting and hosting guest artists, providing office support and ushering at concerts or other events. Volunteers gain insight into the Symphony's operations, while enjoying membership benefits such as discounts on League events, advance notice about upcoming events to obtain best available seats, a monthly newsletter and social events with Symphony musicians. If you're interested in joining the League, download the Membership Form. New members are always warmly welcomed at a reception hosted by the League's Board of Directors. 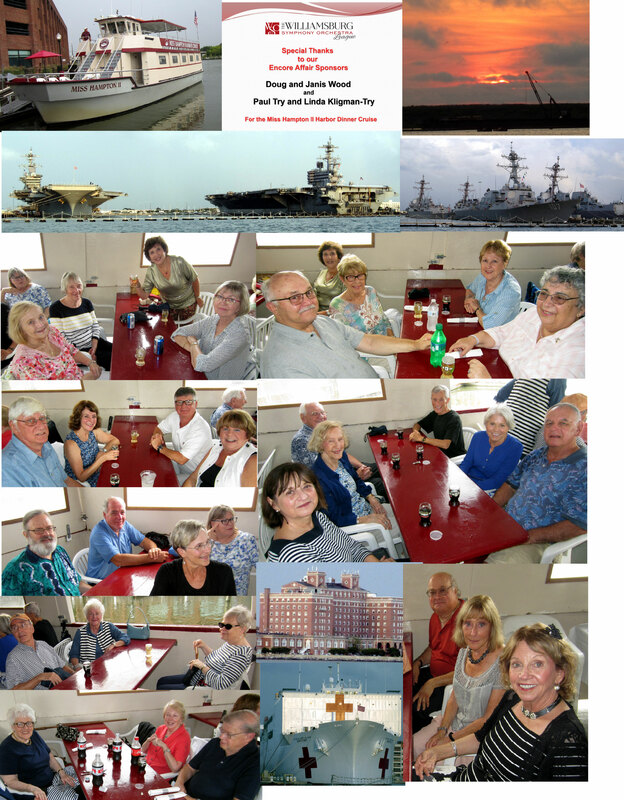 The League provides opportunities for musical enrichment, meeting new friends, interacting with old friends, and participating in a variety of engaging activities. Whether you enjoy working together on a project or volunteering for a specific task, your participation can suit your schedule. Come help us celebrate the Williamsburg Symphony Orchestra's 35th anniversary on Saturday, April 27, 2019 at Kingsmill Resort. A musical cocktail reception, fabulous dinner, and professional entertainment will be capped with a live auction and paddle raise. This annual dinner is the League's major fundraising event for the year and provides an excellent opportunity to socialize with like-minded music lovers in support of our community treasure. Registration form and sponsorship information can be found here. For information about the evening's entertainment, click here. See he exciting auction items here. Encore Affairs are a series of seasonal events that provide for social interaction and fundraising opportunities for patrons. League membership is not a requirement. 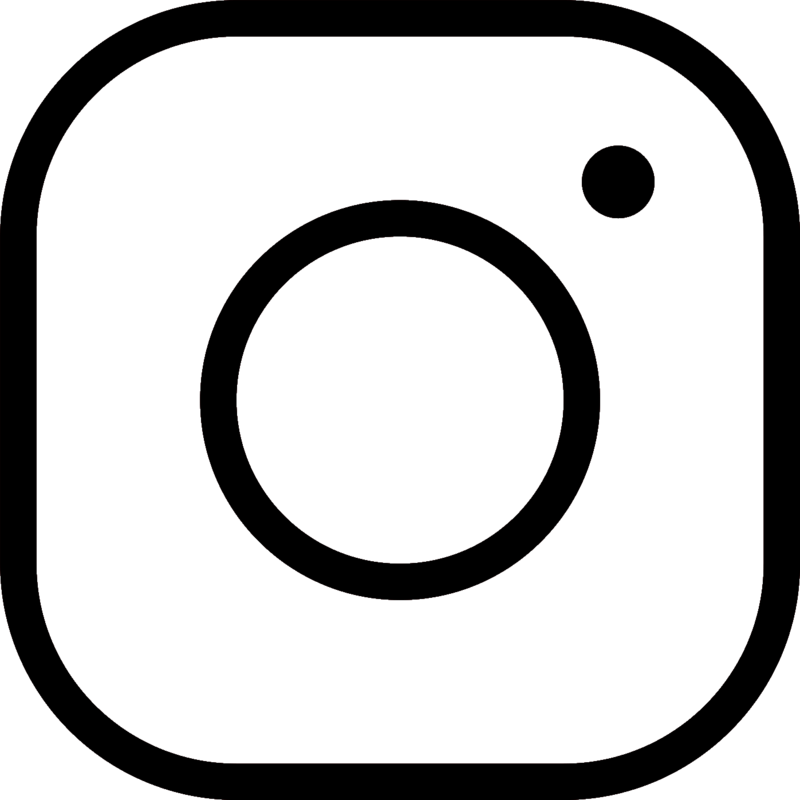 Descriptions and information for the 2018-2019 season events can be found here. For current information on which events are still open for registration or for other information, please contact Annette Thompson via e-mail at annettethompson1991@gmail.com or call her at (757) 645-8266. Now you can own your own orchestra, or part of it anyway. 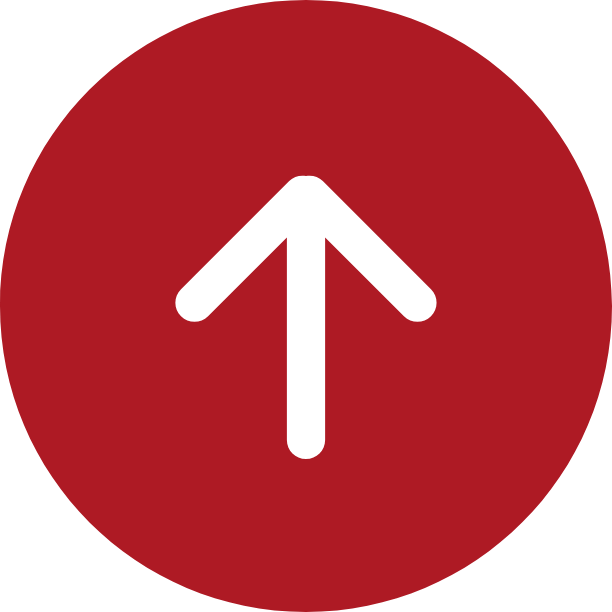 Click here for information and on how you can support a particular instrument, section, or other item of the orchestra for a season. This is one of the League's several fundraising activities. The WSO League Encore Affair at the Trellis is a Hit! 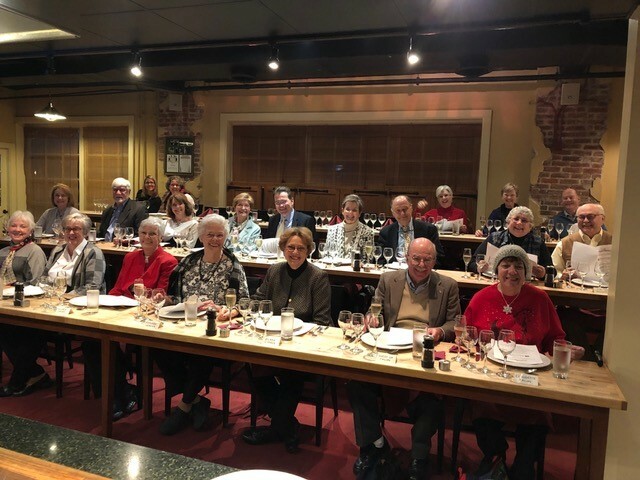 The Williamsburg Symphony Orchestra League held its fourth Encore Affair of the season on January 17, 2019. 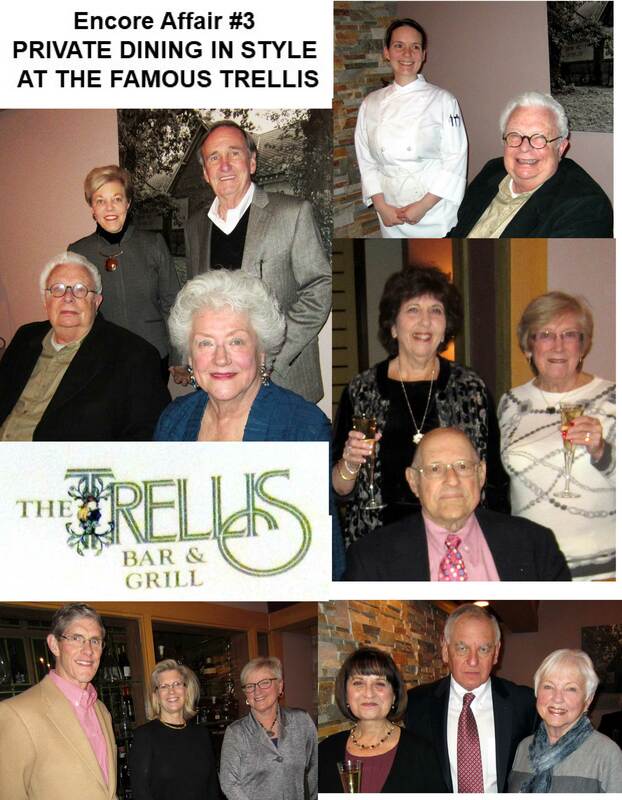 Called “Private Dining in Style at the Famous Trellis”, the event took place in the Trellis’ elegant dining room. Chef Mary Zaragosa provided a unique four course dinner to rave reviews from all attending. Her Winter Bisque (with mushroom, carrot and apple relish) was the hit of the night followed by an exquisite NY Strip Loin. Paired with finely matched wines, the ambiance, food and service made for an outstanding event. Thanks to Trellis Manager Susan Cicero, the donated evening provided an excellent example of the Trellis’ outstanding support for the Williamsburg Symphony Orchestra. On October 12, twenty-six eager patrons gathered at A Chef’s Kitchen, on Prince George Street, expecting good food, good company, and good humor. They were not disappointed! Chef John Gonzales and his assistant prepared a delicious meal, blending their expert culinary instruction with historical and regional context, and with delightful humor. Champagne, hors d’oeuvres, paired wines, a four-course meal, and desert were included in the evening's offering. Skillet-baked cornbread, also referred to by Chef Gonzales as “Life Changing Cornbread,” was prepared with attention to detail and ingredients to produce a mouthwatering moment--especially when slathered with warm honey butter! For those daring to try this and other dishes at home, Chef Gonzales provided a twelve-page recipe booklet. 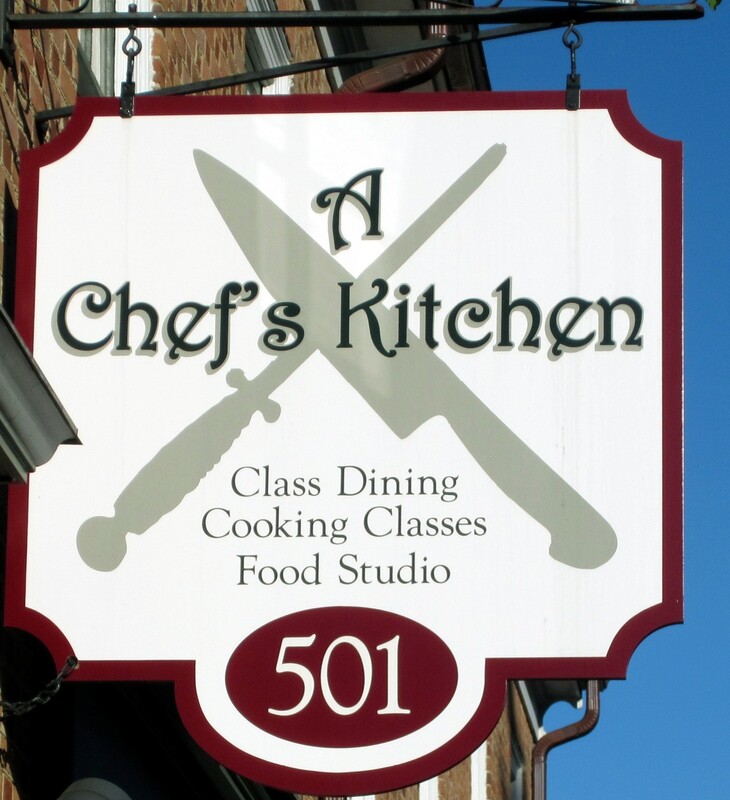 One of the most popular of the Encore Affairs events, A Chef’s Kitchen always sells out quickly and will be among the offerings for 2019-2020. The League greatly appreciates the support of all who participated in this and other Encore Affairs events.